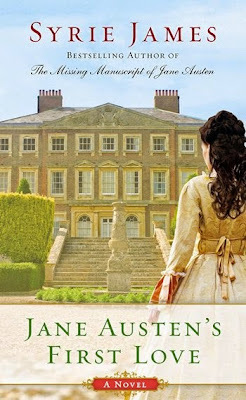 As part of the Jane Austen’s First Love Holiday Blog Tour, I’m pleased to share my review of Syrie James’ latest Austen-inspired novel. Before I ever read a page of Jane Austen’s First Love, I was predisposed to enjoy it. I had the pleasure of visiting Jane Austen’s England last year as part of an Ingenious Travel tour with Syrie James and Laurel Ann Nattress. Our small group spent eight days visiting places Austen lived, visited, or mentioned in her novels. I remember Syrie soaking up all the locations and noting details wherever we went, but especially at Steventon, Godmersham Park, and Goodnestone Park. When Syrie’s latest book was released, I was anxious to revisit the places I had seen and discover the world that she had created. Jane Austen’s First Love begins with Jane and Cassandra in Bath on a “cold morning in late November.” Cassandra is re-reading old letters, prompting Jane to ask, “My letters? Why do you keep those old things? Re-reading them can hardly prove to make lively entertainment of a morning.” Cassandra begs to differ, and within the first pages we have one of James’ signature touches of ironic humor. One of the letters mentions a man on whom Jane says she “once fondly doated” and this phrase triggers memories of the summer of 1791, when Jane met and fell in love with Edward Taylor. Throughout the narrative, James weaves her research on Austen’s life with a realistic story of an intelligent and lively young woman eager to experience the adventure of an extended trip away from home. Visiting her newly engaged brother and the family of his fiancée Miss Elizabeth Bridges at Goodnestone Park in Kent, Jane is thrilled that she will be allowed to participate in the festivities celebrating the engagement. Her mother has even consented to allow her to attend her first ball, although she is not “out.” But when Jane meets the Bridges’ handsome neighbor Edward Taylor, the prospect of a month in his company causes even greater excitement. Taylor, the wealthy heir to a nearby estate, has just returned from the Continent and is a close friend of the Bridges. He is clever, well-read, and daring. To the fifteen-year-old Jane he seems to be the perfect leading man to star in her personal romantic adventure. Edward Taylor has ambitions to leave the comfortable life he will inherit in favor of a military career and encourages Jane to strive for greater achievements in her writing. She discusses literature and history with him and playfully muses, “It makes me wonder just how brief a ‘History of England’ can be, before it loses any meaning entirely!” Observing several of the Bridges sisters bickering and complaining about their beaux, she pens The Three Sisters and shares it with Cassandra and Edward Taylor. These are just two of the many literary allusions that serve as whimsical “Easter eggs” for Austen fans as they follow Jane’s adventures in Kent. I found myself hunting for favorite scenes from Austen’s Juvenalia and published novels as the story unfolded. Unfortunately, Jane also decides to use her creative skills outside the fictional realm. Observing the guests assembled for the engagement party, she becomes convinced that several are paired incorrectly and decides to play matchmaker. When an amateur theatrical production of A Midsummer Night’s Dream is undertaken as a rainy day amusement, Jane uses her power as casting director to manipulate the players according to her design. Romantic misunderstandings ensue and the happiness of the celebration is threatened. Jane does finally manage to untangle the mess she helped create, but has to leave Goodnestone without her happily-ever-after. "I have, as of yet, formed no other lasting romantic attachments; nor has Cassandra, who swore to never love again after Tom died. If one of my mother’s and father’s hopes in leaving Steventon and removing to Bath was that we should find husbands, they must be very disappointed. Nevertheless, I count myself fortunate, for I enjoy a loving connection with a sister who is the sun of my life, the keeper of my every thought, hope, joy, and sorrow; I have a large and happy family, and enough nieces and nephews to occupy my time and fill my heart." "I learned so much that summer…about the human mind and heart—about what motivates people to marry—about what really matters when two people are falling in love." Jane Austen’s First Love bridges a number of genres: Austenesque, Historical Fiction, Romance, and Young Adult. It will appeal to Austen fans as well as readers less familiar with her works or biography. And it might inspire a visit to Jane Austen’s England someday. I received a free copy of Jane Austen’s First Love provided by the publisher, Berkley Trade (Penguin Group) © 2014, in exchange for a review. All reviews expressed are my own opinion. 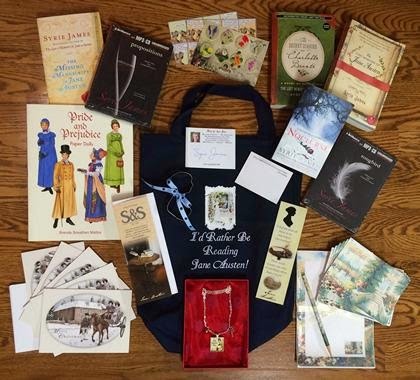 To celebrate the holidays and the release of Jane Austen’s First Love, Syrie James is giving away five prize packages filled with a selection of Jane Austen-inspired gifts and books. (The grand prize giveaway is pictured at right.) The contest is open to everyone, including international residents. Visit multiple stops along the Jane Austen’s First Love Holiday Blog Tour to increase your chances of winning! The contest closes at 11:59pm PT, December 21, 2014. Five lucky winners will be drawn at random from all of the comments on the tour, and announced on Syrie’s website on December 22, 2014. To enter the giveaway contest, please leave a comment below. That must have been a wonderful trip to take part in. Look forward to reading this book. Jane as a matchmaker, that does sound rather fun! Great review. It truly is a lovely book. Hi Vesper! I'm so glad you're intrigued to read Jane Austen's First Love. I hope you get a copy for Christmas (or sooner! ), and that you love it as much as I enjoyed writing it! :) Happy holidays! Jane Austen a matchmaker like Emma? XD Sounds fun! So Emma took after Jane Austen herself in her matchmaking skills? Great! I really want to read this book. It sounds delightful! Thank you so much Syrie. Cassandra's words of never love again reminds me of my great aunt. She had a painting over her bed of her one true love who died on the Russian Front. She remained true to his memory never marrying. How very sad. Your story is beautiful. What a sad but beautiful story, Deborah Ann. Thank you for sharing. Cassandra's love story is so sad. But thankfully she and Jane had each other. They were the sunshine of each other's life, the "comforter of every sorrow," as Cassandra put it. It would be amazing to visit all the places, that Jane wrote about or lived at. Thank you for the giveaway. The hero wants to join the military. I love a military hero. Thanks for the chance to win and can't wait to get my hands on this book. Sometimes I am that woman on a wire and sometimes I'm just wired! The Syrie James tour led me to this post, but your blog and alliterative name makes me want to return! Artzy Heart, I hope you will return from time to time. Sometimes I'm busy juggling and don't get to update things for a while, but it's fun to connect. Enjoy the tour! Great giveaway! The book also looks like one that I would love to read! Just reading the review has inspired me to visit Jane Austen's England.Hope I too will soon get an opportunity to explore the same. Oh, wow. Lucky you. That trip must have been amazing. What a neat remembrance of your trip. Thanks so much for this review! The more I read about the book, the more I want to read it! Defiantly asking for this book for Christmas, now if I can just get my hands on this giveaway! Your review really made me want to read this novel. =) Thank you. Amazing giveway, I'm in ! The more I read on these posts about the book the more I really just cannot WAIT to read it :) It just sounds so amazing and I am a huge fan of historical fiction anyways (mostly Philippa Gregory and her Tudor novels) but really anything in that genre. Thanks, Erika! I love Philippa Gregory, too! Let me just say WOW that you were able to go on the tour with Syrie and Laurel. I am sure that experience will be with you now and forever. I am completely jealous. Being part of the tour was a really fun way to usher in the holidays. I hope that Syrie and Laurel have it in mind to do it again and again. The tour of England was wonderful! I love all kinds of tours, virtual and otherwise. Hope you get to see Jane Austen's England someday too! Good luck in the drawing! So glad you stopped by on the tour! Thanks! Sounds like a great book ! Looking forward to read it soon !